to pay off last year's charges. For most of us, holiday shopping — whether it is seen as an adventure or a chore — is an inevitable part of our future. 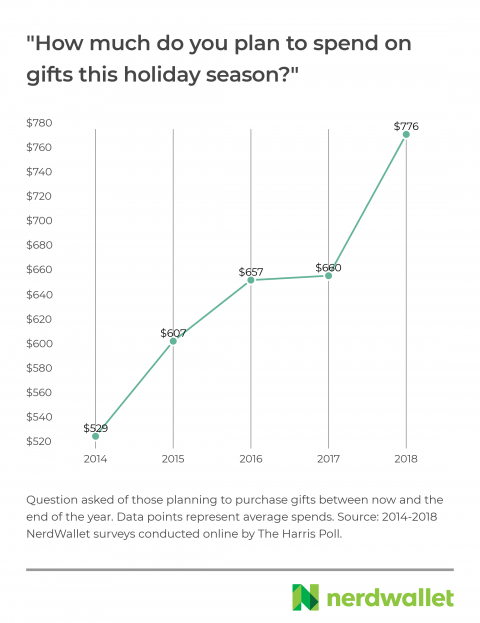 In fact, nearly 9 in 10 Americans (89%) plan to buy gifts for friends and loved ones this holiday season, according to a new NerdWallet survey, conducted by The Harris Poll, of over 2,000 U.S. adults. Five years after we first asked about holiday spending, shoppers say they plan to spend more than ever in the 2018 holiday season — even as 39.4 million Americans are still paying off last year’s holiday shopping credit card debt. Spend more. Holiday shoppers plan to spend $776 this holiday season, on average — $116 more than they planned to spend last year. Charge more. Nearly three-fourths (73%) of shoppers plan to use a credit card this holiday season to pay for gifts, compared with 58% last year. And this year, those using a card estimate that they’ll charge $650, on average. Take longer to pay it off. Holiday credit card users anticipate it will take them 3.2 months to pay off their holiday charges this year, on average. Those who used a credit card for their 2017 holiday shopping say it took 2.3 months, on average, to pay off those balances. Some 2017 shoppers are still working on last year’s debt. 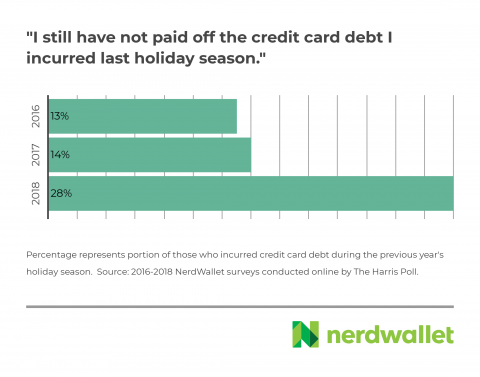 About 39.4 million Americans are still paying off credit card balances amassed over the 2017 holiday season, according to NerdWallet’s analysis. Women plan to spend (and charge) less than men. Women holiday shoppers anticipate spending $714, on average, versus $842 for men, this holiday season. Those who plan to use plastic will charge $140 less, on average, than men. Online shopping wins on Black Friday. Seven in 10 (70%) Americans plan to shop on Black Friday this year — 51% expect to do so online and 40% in-store. The holidays carry so much excitement and emotion, and for many of us, spending is part of the celebration. That’s why getting an early start on budgeting is so important. Americans planning to buy gifts this holiday season are feeling generous, reporting they expect to spend $776, on average. That’s $116 more than they anticipated for the 2017 holiday season, a leap of about 18%. From 2016 to 2017, on the other hand, anticipated budgets climbed only $3. 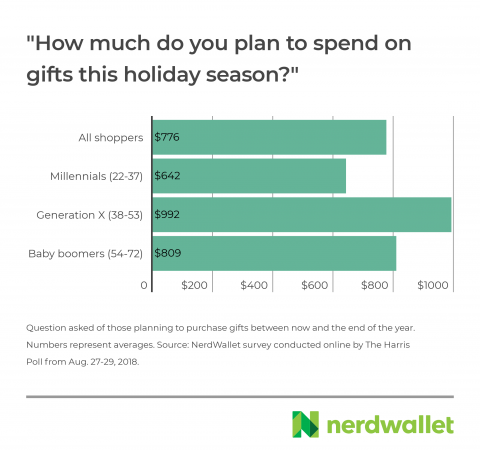 Across generations, Generation X holiday shoppers plan to spend significantly more ($992), on average, than other generations. Differences in planned spending across age groups may be explained by income, as earnings generally increase with age until retirement, according to data from the Bureau of Labor Statistics. About half (51%) of all Americans say they “typically overspend” on holiday gifts, but only 16% of Americans regret that overspending. Despite spending less on average, holiday shoppers from younger generations are more likely to admit to typically overspending. Click here to see who regrets blowing their holiday gift budget the most. Nearly three-fourths (73%) of holiday shoppers plan to use a credit card for some gifts this year, compared with 58% of shoppers last holiday season. This year, those charging gifts anticipate putting $650 on their cards, on average. And while overall spending budgets are higher this year, confidence in paying down credit card debt is not. Those planning on charging at least some of their holiday gifts estimate it will take 3.2 months, on average, to pay off that debt. Credit card shoppers did better than that with last year’s holiday debt, taking 2.3 months to pay it off, on average. Still, 28% of shoppers who incurred credit card debt, or 39.4 million Americans, are still paying off 2017’s holiday balances, a dramatic increase over last year, when 14% were paying off the prior year’s holiday debt. Among 2017 holiday shoppers who used credit cards, those with household incomes of less than $100,000 are more likely to still be whittling away last year’s holiday debt — 36% versus 17% of those with an income of $100,000 or greater. If a holiday shopper puts the estimated $776 on a credit card and makes only minimum payments, they’ll pay $295 in interest over a 4.4-year period before reaching a zero balance, according to NerdWallet analysis. Interest can quickly negate any benefit of credit card rewards. Like last year, gift-shopping men plan to spend more than women, but the gap has widened. In 2017, these men planned on spending $85 more, on average, than women ($704 versus $619). This year, gift-buying men will spend $842, on average, and women $714, a difference of $128. As with differences among generations, some spending differences between men and women could be explained by income — since 2004, women’s earnings have hovered around 80% to 83% of men’s, according to the Bureau of Labor Statistics. Gift-buying men are also more likely to use a credit card than women — 79% versus 67%, respectively. And those who will use plastic anticipate they’ll charge more, on average — $717 versus $577. Despite this, these women anticipate taking slightly longer to pay off those balances, 3.5 months compared with 3 months, for men. Seven in ten (70%) Americans expect to shop on Black Friday this year. Half (51%) will shop online, and 40% will shop in-store. Those who plan to shop in-store cite the tactical experience as a top reason — 52% said they want to see and hold the items when they shop. Additionally, nearly half (48%) of those in-store shoppers believe they’re getting the best deals shopping in-person. 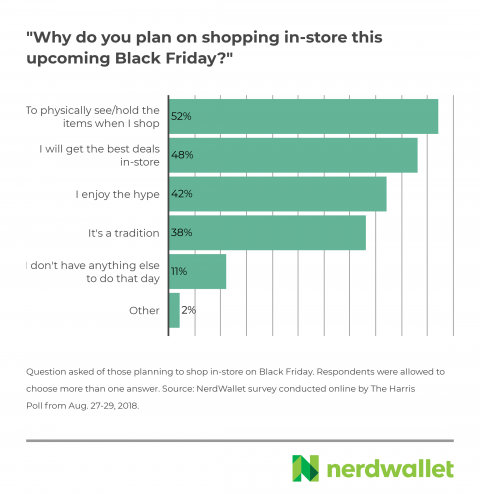 Prior years’ analysis from NerdWallet revealed that Black Friday sales aren’t always the deals they’re made out to be, whether it’s online or in-store. A slightly smaller proportion than for Black Friday, 68% of Americans plan on shopping on Cyber Monday. Click here to see which generations plan on showing up to shop on Black Friday and Cyber Monday. We asked how people are planning to save when shopping this holiday season — not just on gifts and holiday-related purchases, but on everything — and found that many may be missing savings’ opportunities. The most common savings approach is using retailer coupons or promo codes. Over half (54%) of Americans say they’ll do this. But just 36% will use money-saving apps, and 33% will attend doorbuster sales — those that are typically for a limited time on a certain day and often exclusive to specific products. In addition to reducing their bottom line, some shoppers may be trying to spread the impact of holiday expenses. One-third (33%) of holiday shoppers are likely to use layaway this year, and 21% are likely to use shopping loans, also called point-of-sale loans. These approaches are most popular with younger shoppers — about half (49%) of millennials planning to shop say they’re likely to use layaway versus 35% of Generation X and 18% of baby boomers. “When you’re deciding how to pay for your items, be sure you understand any fees or interest you will be charged. Shopping loans are relatively new and the details can vary by retailer; as with layaway, be sure to read the fine print before you commit,” Palmer says. It may be taboo, but 70% of Americans admit to having regifted a holiday present. And while 48% of them say they did so because the gift wasn’t useful, 31% passed along a gift specifically to save money. Click here to see which generation was most likely to regift as a money-saving strategy. 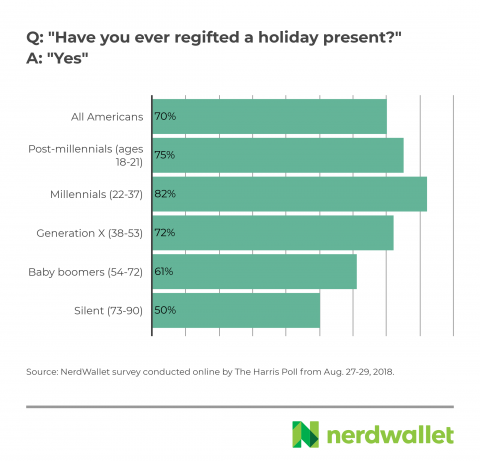 Millennials are more likely than older generations to admit having regifted a holiday present. The surveys were conducted online within the United States by The Harris Poll on behalf of NerdWallet from Aug. 27-29, 2018, among 2,012 U.S. adults ages 18 and older; from Oct. 12-16, 2017, among 2,135 U.S. adults; from Sept. 20-22, 2016, among 2,036 U.S. adults; from Oct. 22-26, 2015, among 2,052 U.S. adults; and from Nov. 3-5, 2014, among 2,013 U.S. adults. These online surveys are not based on a probability sample and therefore no estimate of theoretical sampling error can be calculated. For complete survey methodologies, including weighting variables and subgroup sample sizes, please contact Jessica Ayala at jessica@nerdwallet.com. “Holiday shoppers” refers to Americans who plan on purchasing any gifts this holiday season. “Holiday season” refers to the period between now and the end of 2018. NerdWallet defines generations in the following manner: Post-millennials, ages 18-21; millennials, ages 22-37; Generation X, ages 38-53; baby boomers, ages 54-72; silent generation, 73-90. When a generation is not listed in results, it’s due to a small reporting base and cannot be considered a representative sample. When asked whether respondents plan to use a credit card for holiday shopping, the 2017 and 2018 survey question type and phrasing changed year over year. Number of Americans still paying for 2017 holiday shopping credit card debt was calculated using 2017 population estimates from the U.S. Census. Credit card payoff estimate assumes 15.54% APR and minimum monthly payments of 3% of the balance or $20, whichever is greater.